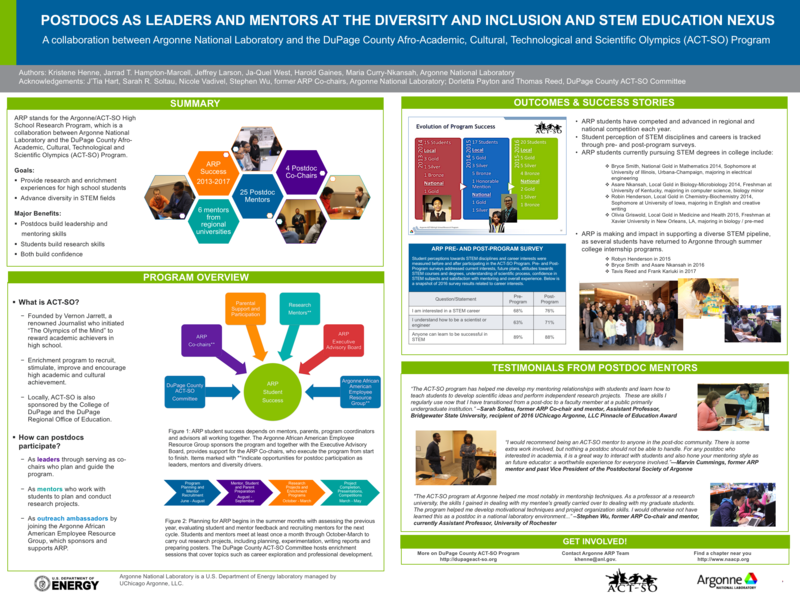 Mentors in the ARP play a vital role in guiding and encouraging students as they explore STEM careers and work to complete their independent projects. Choosing to become a mentor gives you the chance to help facilitate deeper exploration of STEM concepts all while giving back your community in a meaningful way. ARP mutually benefits students and mentors by enriching students’ knowledge and technical skills while providing mentors an opportunity to exercise and fine-tune their leadership and teaching skills. And, as ACT-SO is a national program, the success of its participants shines a light on the capabilities of the mentors who support them, showcasing their ability to cultivate talent and teach. The role of the mentor is to provide guidance to ARP students as they develop independent research projects that are designed to test a hypothesis. The students are the drivers of the project, and mentors are there to provide support and additional ideas. In addition, mentors need to serve as the filter for feasibility, safety and experimental design. Each mentor is assigned one student, whom they will communicate with regularly over a period of six months. When matching mentors with students, we make every effort to align students and mentor with similar interest. While some students enter the program with defined projects or interests, other students may enter the program without having had exposure to a wide variety of science classes. These students are interested in science, but may not have a defined project area and are willing to work on a project related to the mentor’s interests or research area. ARP coordinators host one session a month (six total) over the course of the program. Mentors are expected to attend at least four of the six sessions available, and arrange to meet with their mentee individually if they cannot attend. The first part of each session is reserved for enrichment activities designed just for ARP students. These activities may include presentations about STEM careers options, reviews of laboratory safety and workshops on how to write scientific papers and prepare posters. The second portion of each session (3 hours) is dedicated to breakout meetings between individual mentors and students. Along with attending group sessions, mentors will also need to communicate with their students regularly. These meetings may take place in-person at Argonne or another other location decided on with students and their parents, or via phone, Skype, Google Hangout, etc. Mentors and students should communicate at least once a week by phone, email, or video chat. With their mentor’s support, students will develop a testable hypothesis, conduct an experiment and present their results in a 5-page paper that will be due in early March. In addition to the paper, students will prepare a poster that they will use to present their work in the regional ACT-SO competition, hosted by DuPage County in March. Argonne’s Learning Center provides various resources to support mentors and students in the ARP, including three fully equipped lab rooms, as well as a scanning electron microscope, GC-mass spec and spectrometers. Mentors are welcome to schedule time to use the space and can bring small portable instruments from their own labs to use within it. ARP also provides computation resources to students as needed, including access to LoggerPro software.